Overclocking the Raspberry Pi Depending on the model, the Raspberry Pi has a CPU clock speed of 600 or 700 MHz. If you like, you can overclock the Raspberry Pi depending on the model over 1000 MHz. Depending on the model, Raspberry Pi has a CPU clock speed of 600 or 700 MHz. If you like, you can overclock Raspberry Pi depending on the model over 1000 MHz. One should be aware, however, that overclocking shortens the life of Raspberry Pi and can lead to instability of the system. First, determine the frequency with which Raspberry Pi is currently clocked and what is set in the configuration. Overclock Raspberry Pi to 800 MHz. Reset the original clock frequency. First, we'll determine the frequency with which Raspberry Pi is currently running. The indication is in kHz. If Raspberry Pi is not overclocked, then it has a value of "600000" or "700000". Then we check which clock frequency is actually set. This information is also in kHz. "700000" is the default setting. If the two values deviate from one another, then overclocking already takes place. Note: While a Raspberry Pi 1 (A, A +, B, and B + models) runs at 700 MHz by default and is not overclocked, a Raspberry Pi 2 runs at 600 MHz and overclocks to 700 MHz when needed. First we call a configuration file on the boot partition. Here you can make various system settings. Among other things, the clock frequency. Here is a line that needs to be changed. Depending on the model, a different value may also exist here. Here you enter 800 as the value. That's equivalent to 800 MHz. You can also enter more. However, you should be careful about overclocking and first check if the overclocked system is stable. To get the setting, you have to restart Raspberry Pi. After the restart, you check whether the settings exist and how high the current clock frequency is. The output should be "800000". The output corresponds to the current clock frequency. If the overclocking is done here should be "800000". That does not have to be that way. If not, then everything is fine. The reason: Raspberry Pi overclocks dynamically. That is, if the load is high, then Raspberry Pi will dynamically clock up until it reaches the overclocking frequency. If overclocking is not necessary then it will not happen and Raspberry Pi will only run at its 600 or 700 MHz base clock (depending on the model). By default, the models A, A +, B and B + have a basic clock of 700 MHz. By default, the Model 2 B has a 600MHz basic clock and a dynamic overclocking rate of 900MHz. Basically, Raspberry Pi works with dynamic overclocking. From when it triggers, you can determine as follows. A value of 50 means that only when the CPU is about 50% full, then the CPU will clock up to the set clock rate. If the demand for computing power goes down, the clock rate also returns to the basic clock. Changing the clock frequency can cause a short stutter, so setting a fixed clock rate makes sense in some cases. So if you want Raspberry Pi not to work dynamically, but at a fixed clock rate, then you have to set that manually. For this we open the configuration file with the system settings. After saving, closing and restarting, the clock frequency is set to a permanent value. Note: If you permanently overclock Raspberry Pi, then you also have to worry about a stable power supply. As a rule, you do not have to worry about cooling. 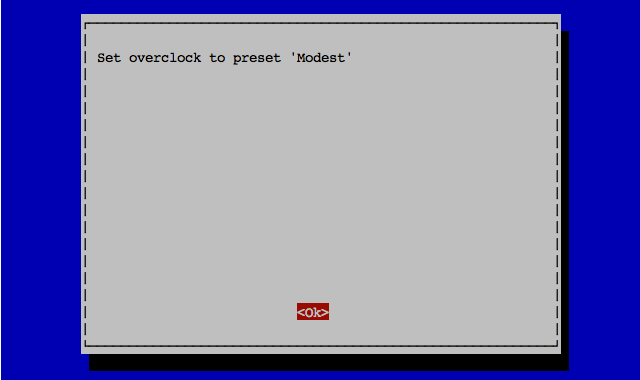 Solution: Set overclocking via "raspi-config"
"raspi-config" is a tool on the command line. 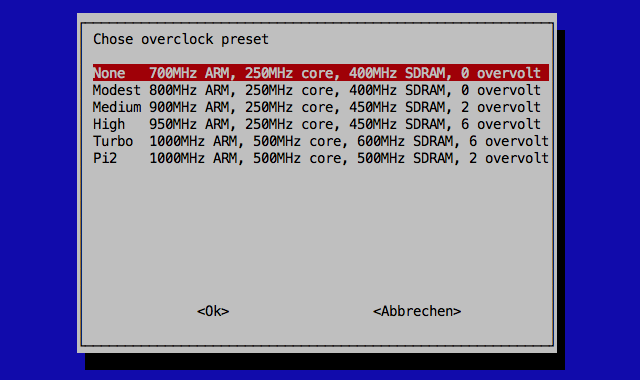 When overclocking has the advantage that it not only changes the clock frequency of the processor, but makes the same meaningful values for other related settings. Also, those who only use the overclocking feature of "raspi-config", need not worry about a loss of warranty. The Raspberry Pi is operated within its limits. Overclocking is absolutely harmless. Only those who enter their own values into the "/boot/config.txt", have to reckon with the Raspberry Pi being set to a non-resettable "warranty-extinguished" bit. After the call you get to see the main menu. There you select with the arrow key "Overclock" and press "Return". Note: Overclocking Raspberry Pi 3 Model B is no longer provided in this tool. 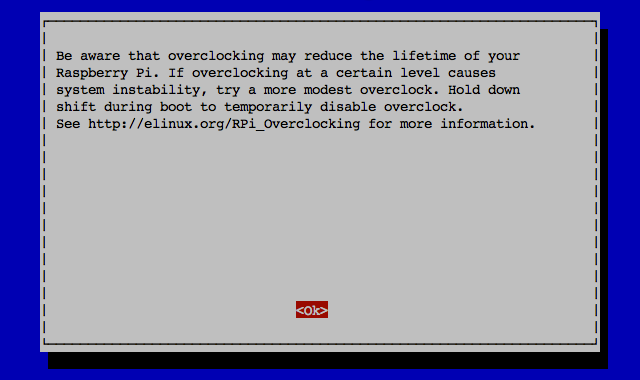 Then a warning appears, which indicates that the life of Raspberry Pi is shortened by overclocking and it can lead to instability of the system. Here is the hint that you can temporarily disable the overclocking by pressing the "Shift-key" during the boot process. So you have at least the opportunity to undo the overclocking, if you do not get the Raspberry Pi after overclocking to run. Below is a list of overclocking settings. In contrast to the configuration via command line you do not have the possibility to make free settings here. There are only 5 modes of which 4 are for overclocking. You can choose between None, Modest, Medium, High and Turbo. Depending on the model and the kernel, there may be other or additional entries here. 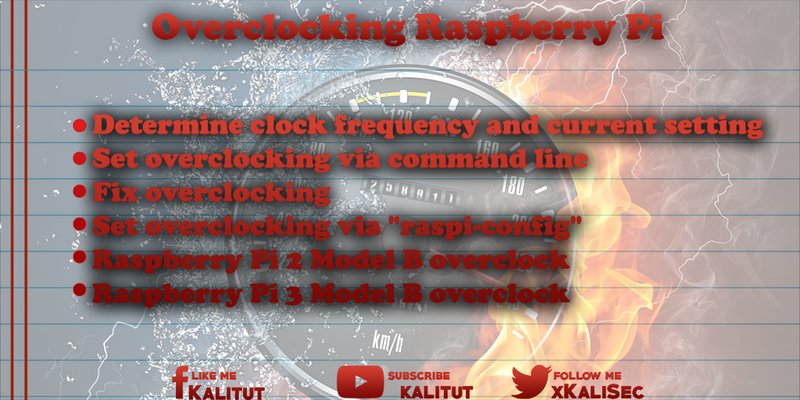 For users of Raspberry Pi 2, the overclocking menu can cause confusion. Because here is not the menu item "None", but "Medium" the normal state. Another curiosity is the fact that always the entry "None" is selected, although actually before another setting was made. The menu does not show the current entry. The first time you try "Modest" or "High". That should work in any case. Later you can also try the other overclocking modes. "Turbo" is generally discouraged. Here it always comes back to problems, by an unstable system. Use the arrow key to select the desired operating mode and then press "Return". After that, the display briefly jumps back to the command line, in order to then display the confirmation for the configuration change. Pressing "Return" returns the configuration tool to the main menu. Here you have to quit the tool: Two times arrow key "Right" and then "Return". 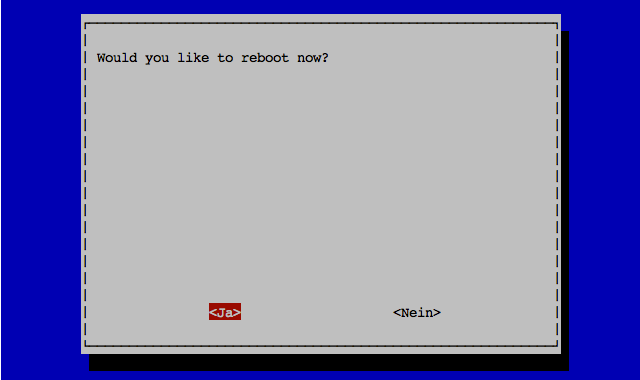 Now you are asked if you want to restart the system. This can be confirmed by pressing "Return". If the system restarts successfully, you have an overclocked Raspberry Pi. Raspberry Pi 3 B should not be overclocked. 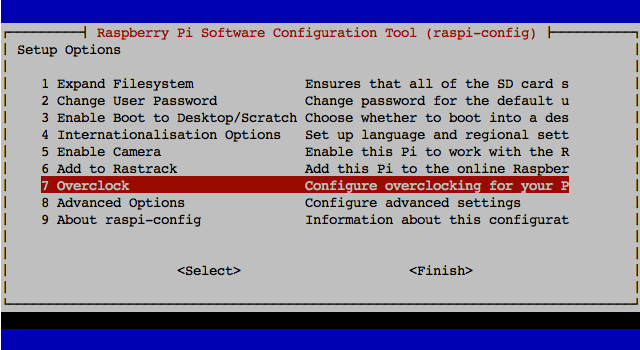 In the configuration tool "raspi-config" there is no possibility for this. One could still in the file "/boot/config.txt" over the appropriate parameters a little rauskitzeln. But that does not make any sense, because the Raspberry Pi 3 B is already running at its maximum.